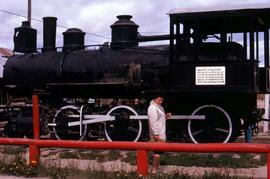 Colour Kodachrome 35mm slide depicts Phyliss Snider in front of the number 51 locomotive of the White Pass and Yukon Route, which has been on display in Whitehorse since 1958.Note: Brightness and colour adjusted on JPEG. 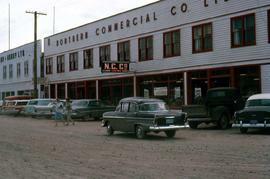 Colour Kodachrome 35mm slide depicts a street with parked cars and the building of Northern Commercial Company, a retail store chain, in Whitehorse.Note: Brightness and colour adjusted on JPEG. Colour Kodachrome 35mm slide depicts an unpaved street with parked cars and buildings, in downtown Whitehorse.Note: Brightness adjusted on JPEG.